Roam where you want to—worry free! When you go on vacation, you want to have a relaxing and stress-free time—whether it’s enjoying the Mediterranean sun while sipping a glass of rosé, or exploring Down Under, under the waves. That’s why Azamara Club Cruises is proud to offer CruiseCare®. Think of it as a little extra reassurance and some peace of mind, while you’re off discovering the world with us. CruiseCare helps protect you before, during, and after your voyage with cancellation and interruption benefits, sickness and accident medical services, and baggage protection. But more than anything, CruiseCare means you can spend less time focusing on the “what ifs” and more time on the spectacular sights and unforgettable moments you’ll experience on an immersive Azamara voyage. Voyage costs and CruiseCare prices expressed in USD. Prices may change without notice. Your bags are packed, and you’re ready to go. But sometimes life has other things in mind. Cancel your trip, for whatever reason, and you’re refunded. Up to 100% cash back for the unused portion of the cruise if you cancel for a specified reason, like illness or injury. Should you cancel for any other reason, you might be eligible for Cruise Credits of 75% of the price of your cruise. Of course, hopefully you won’t need to use this, but if you do, you may be required to provide documentation to support your claim. CruiseCare is not available to New York residents.1Notice to Minnesota and Missouri residents only: Trip Cancellation benefits are underwritten by Arch Insurance Company. In addition, Cancel for Any Reason credits can be purchased separate from the Travel Insurance Benefits. Contact 1-888-722-2195 for details. Delays are a part of travel sometimes, but with CruiseCare, they don’t have to be anything more than a mild inconvenience. CruiseCare covers your accommodations, meals, transportation, and help you catch up to your cruise if necessary. And for those times you arrive when you’re supposed to, but your baggage opts for the scenic route, your CruiseCare coverage will reimburse you up to $500 for the purchase of personal effects needed until your bags are returned. There’s never a good time to feel under the weather—but it can be especially tough on vacation. CruiseCare also covers certain medical services to help you get back to feeling ship-shape in no time. And in the unlikely event of a more serious health issue, your coverage includes emergency medical evacuation, so the only thing you need to worry about is feeling better. 2Travel insurance benefits are administered by Aon Affinity and underwritten by Arch Insurance Company, with administrative offices in Jersey City, NJ (NAIC #11150) under Policy Form series LTP 2013. This is a brief overview of the coverages. Subject to terms, conditions and exclusions. This is a general overview of insurance benefits available. Coverages may vary in certain states and not all benefits are available in all jurisdictions. Please refer to your certificate of benefits or policy of insurance for detailed terms, conditions and exclusions that apply. With CruiseCare you need not have a care in the world thanks to our global, 24/7 network of service providers. With a single phone call, we can take care of last-minute flight and hotel bookings, translation services, destination guides including weather updates, luggage location, and so much more. CruiseCare also makes your health our top priority and our network includes highly qualified health professionals. We also provide additional services like up-to-the-minute travel medical advisories, emergency medical, dental and legal assistance, replacement of prescriptions including eyeglasses/contact lenses and dental appliances, and referrals to approved local providers. 3Non-insurance emergency assistance services are provided by On Call International. You can purchase CruiseCare at any time between making your initial deposit and final payment. Please note! Your CruiseCare Cancellation Penalty Waiver takes effect only after: 1) you have paid a deposit for your cruise; 2) you have paid for your CruiseCare plan cost in full, in addition to any required cruise deposits due. Travel insurance benefits take effect on your departure date. Payment of your cruise fare alone will not activate any part of the CruiseCare program. Your CruiseCare plan cost is fully refundable if you cancel before the published penalty period for Azamara Club Cruises. 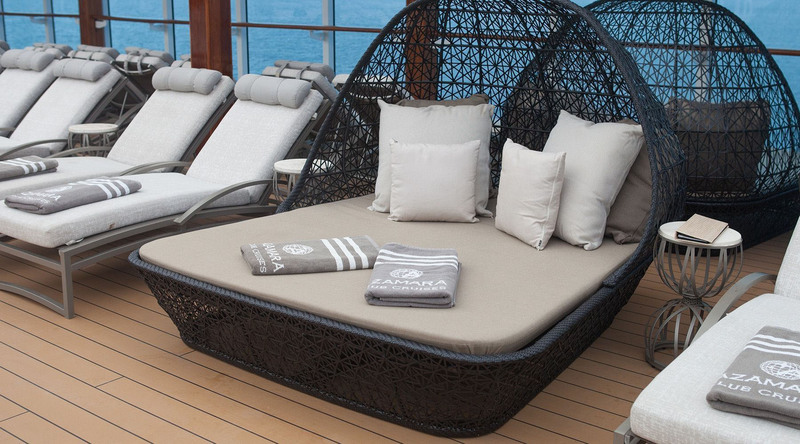 or email Azamara Club Cruises.